Table bases made with steel columns, cast iron bottoms, cast iron or steel top "spiders" held together with threaded steel rods are the workhorse standard in the restaurant industry. See below for which size table bases to use with which size tops. Also, standard table bases can be used in combination to support large or unusually shaped table tops. You should never use a restaurant style pedestal base that is too small to support your table top. Please Note: Table top sizes for bar height bases should generally be less than those shown below. Suggested sizes are for wood and plastic laminate table tops. 22" X 22" table base will support table tops up to 30" X 30" - 30" Diam. 30" X 30" table base will support table tops up to 42" X 42" - 42" Diam. 36" X 36" table base will support table tops up to 48" X 48" - 54" Diam. 22" X 30" table base will support rectangular table tops up to 24" X 47"
End Bases are a versatile solution for supporting a variety of table top shapes. top for which you are selecting table bases. and differences between square and radius corners. 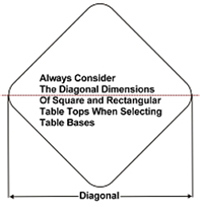 Table size determines the size and type of table base needed. See: What Size Top Do You Need? Contact us for table recommendations and quotations. Restaurant table bases are generally finished in black. We believe that for most commercial and institutional table projects black is your best choice because table bases tend to "hide in the shadows" anyway. Table bases are the last thing people notice when walking into a restaurant and most restaurateurs don't feel they need to put a lot of money into a "showy" table base. There are any number of exceptions to this of course but you will be in good company going with basic black. Other table base colors are available though and we encourage you to ask about color options should your project require something other than black.